Rated as one of the best locations on the continental United States, there is no better place to learn how to windsurf and this local supplier guarantees they'll have you windsurfing in under two hours. Their stable boards and small sails combined with ideal location make learning to windsurf safe and fun. In business since, 1982, you are invited you to come make memories Miami Style! Begin with basics on land then enter shallow bay waters. In small groups, each participant will learn the basics of sailing on a reach, correct stance, safety, and how to turn around (tack) successfully. Once you have an understanding of the basics, you will receive your own individual rig while the instructor continues to help you improve your skills. If you can ride a bike, you can windsurf! Led by U.S. Sailing Certified Instructor Trainer, our staff loves seeing the sense of success and satisfaction our students experience within just the first hour. Bring a snack and beverage, wear a bathing suit, and you are ready! It is recommended to wear lotion sunscreen (verses oil). Parking is free and there is an outdoor shower at the adjacent bathroom. Storage is available to hold onto your car keys for you. 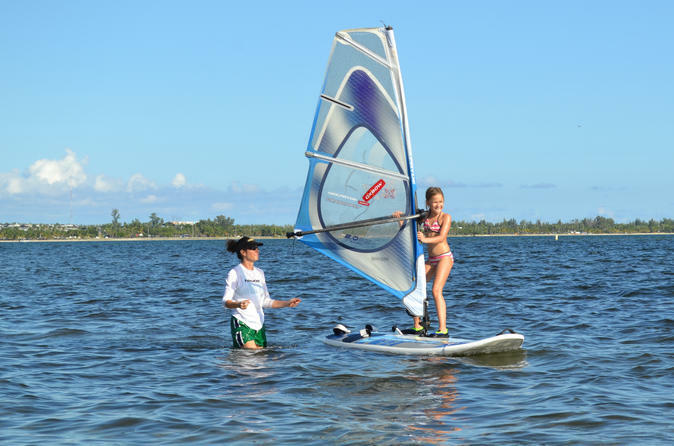 The location, "Windsurfer Beach," is ideal for learning to windsurf. The wind tends to blow onshore or side shore and located in a cove, away from any motorized boat activity. Plan to arrive 20 minutes prior and review our location prior to driving out (we're easy to pass your first time). Lessons are taught three times a day.